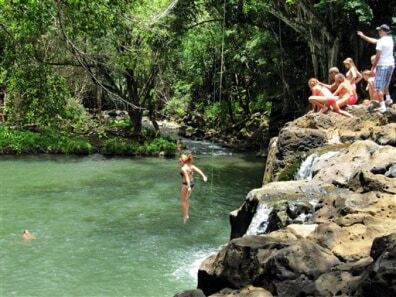 A woman jumps into Kipu Falls in Lihue, Hawaii, on the island of Kauai. But the alluring beauty of the waterfall and natural pool conceals a deadly side. Five visitors to Kauai, all male, have drowned at Kipu Falls in the past five years.